Of the 70% of employers who search online, more than half of employers (54%) have found content on social media or during an online search that caused them to fire or not to hire an individual. From hospitality to entertainment to retail environments, Fama provides the perfect solution for companies whose employees are or will be in frequent contact with the public. Through our research and ongoing work with clients we’ve identified a clear connection between online behaviors and offline risk. 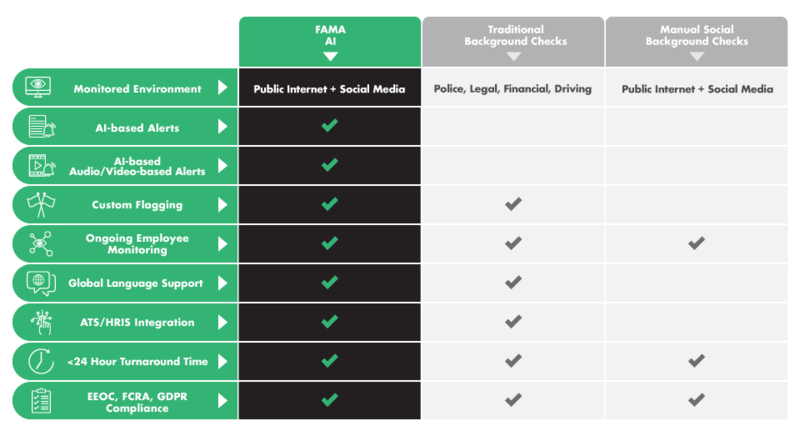 Fama delivers your social media screening reports within 24 hours and with the ready availability of this data, employers have every reason to update their screening process to include Fama.